A handful of dreamers set out to change the status quo in medical education in the 1970s and founded an international University that has educated more than 17,000 people worldwide…and impacted the word by the many thousands more who have benefitted from their knowledge and care. Their vision of what international education should be attracted progressive education leaders with prestigious credential to shape the future of the young school. The result of their shared dream was St. George’s University. It began on July 23, 1976, when Charles Modica, Louis Modica, Edward McGowan, and Patrick F. Adams witnessed the birth of their dream through an act of Grenada’s Parliament, establishing St. George’s University School of Medicine. It opened its doors in January 1977, welcoming a modest group of students to Grand Anse as part of its charter class. They were the first of many, the University having produced over 14,000 physicians who have gone on to practice in all 50 US states and more than 50 countries worldwide. What was an opportunity for the charter class has developed into the opportunity for many. The Doctor of Medicine program at St. George’s University School of Medicine has been accredited and approved by many external bodies, such as the Caribbean Accreditation Authority for Education in Medicine and other Health Professions (CAAM-HP), the Government of Grenada, and medical boards throughout the United States. 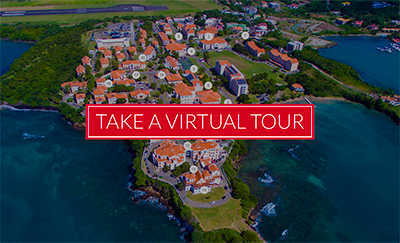 SGU students now have access to clinical training opportunities at over 70 affiliated hospitals and clinical centers in the United States, Canada, Grenada, and United Kingdom, and annually secure highly competitive US-based residencies, with SGU serving as the number one provider of doctors into first-year positions in the US over the last six years combined, including more than 870 in 2016 alone. St. George’s University expanded its medical program even further in 2005, this time overseas, establishing the Keith B. Taylor Global Scholars Program, which allows School of Medicine students to spend their first year of basic sciences at Northumbria University in Newcastle, United Kingdom. With it, these students obtain unprecedented international experience in medicine, gaining exposure to models of medicine in three different countries by the time they graduate. In addition to basic science training, students have been able to carry out short- and long-term, multidisciplinary research and education programs with the Windward Islands Research and Education Foundation (WINDREF), which the University established in True Blue in 1994. Beyond medicine, SGU has created a wide range of programs for students of all interests. In 1996, the newly founded School of Arts and Sciences welcomed its first student class, and in 1999, the University established the School of Veterinary Medicine, which is now accredited by the American Veterinary Medical Association (AVMA) and owns clinical affiliations with 29 US veterinary medical schools. Since then, more than 1,200 SGU veterinarians have entered the workforce. Also in 1999, the Master of Public Health program launched. It has since gained accreditation from the Council on Education for Public Health (CEPH), and the Department of Public Health and Preventive Medicine has been distinguished as a World Health Organization Collaborating Center (WHO CC) for Environmental and Occupational Health, the first of its kind in the Caribbean. SGU has also created a School of Graduate Studies, which offers more than 30 distinct programs across a wide variety of professional fields. In 2014, St. George’s University received an equity investment from a group led by Canadian investor Altas Partners and a fund advised by Baring Private Equity Asia, to assist the University with its efforts in forging ahead with a new chapter of its development. In 2015, Dr. G. Richard Olds was appointed as President and Chief Executive Officer to help lead this change. There was an immediate and overwhelming response from the Grenadian people, as well as people in the Caribbean region, who were anxious to take advantage of this opportunity for tertiary education. The School began offering night courses in the Fall of 1996, and baccalaureate degree programs in January 1997. 2010 Master of Public Health Degree Accreditation by the Council on Education for Public Health (CEPH).